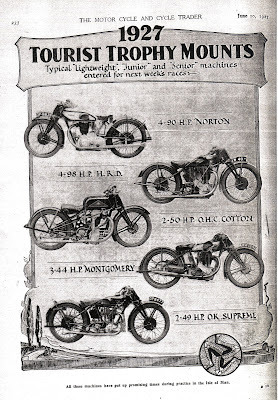 -SG- As I have mentioned before, there were other motor cycle related periodicals in the twenties which few, if any, of the Norton historians seem to have looked at in their 'MotorCycle/Motor Cycling' - centred researches. 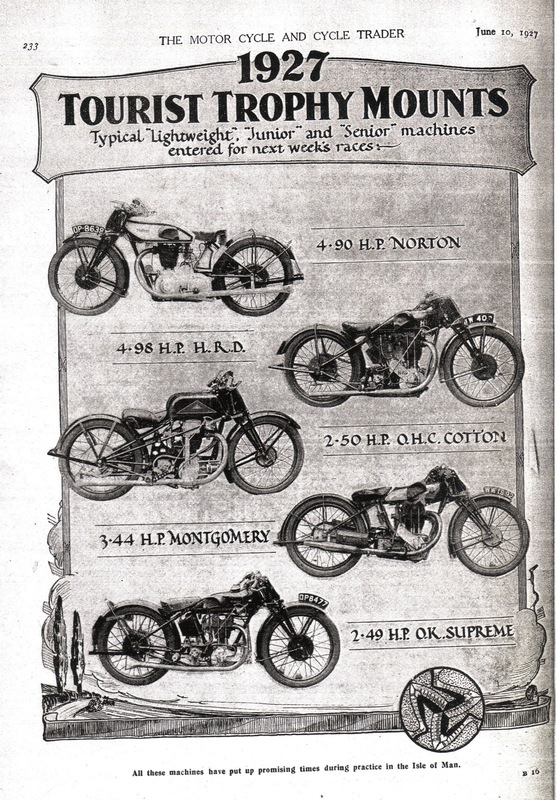 One of them was the weekly trade magazine 'The Motor Cycle and Cycle Trader' and here's a page from it, from June 10th 1927. The Norton pictured is one of the few OHV machines (not yet called ES2!) which were run by Nortons in the Senior alongside the show-stealing CS1. Ignoring the obvious possibilities of number plate or engine switching, this particular bike seems to be the one ridden by Australian Len Stewart. Stewart was highly successful 'on the dirt' in his native country but unfortunately, he fell off on the first lap of the race. Some Australian commentators think Stewart was given a CS1 to ride by the works, and as he had an early race number, became unwittingly the first rider of an OHC Norton to compete in the TT. Unfortunately, the post race reports don't support this view but any new input one way or the other will be more than welcome.